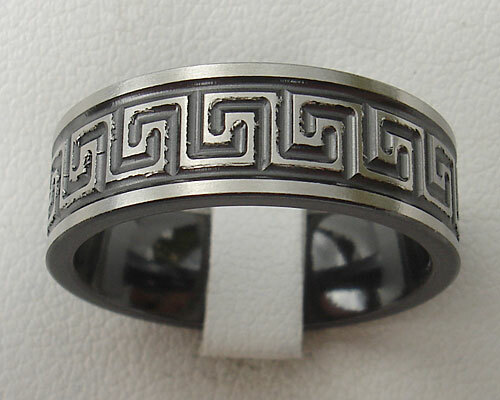 Men's Greek Key Wedding Ring : LOVE2HAVE in the UK! 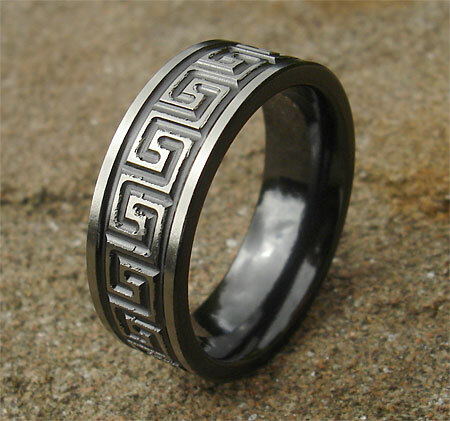 A men's Greek Key pattern wedding ring. The Greek Key pattern has many interpretations but the one that we thought of when we first saw this ring was that of the bonds of love with its interconnected radiused design, therefore, making this pattern a perfect choice for a wedding ring. It comes based on a flat profile black zirconium ring with grey relief engraved and the Greek Key design boldly engraved around its outer. The side of the ring, as well as the inner surface, are black, together with the engraving to give this model a bold look with visual appeal. It measures 7mm wide making this suitable for a men's wedding ring. The Greek Key, created with a laser engraving machine, is the only technical way to engrave titanium and zirconium this accurately when it comes to symbols and patterns that require mathematical precision. This ring is just one of the many examples of the engravings we can offer, and when combined with the black zirconium it makes a very eye-catching design indeed. We have the model pictured here in a satin finish which in our opinion suits the design best of all, but you can have polished if you prefer.